New Fortune Chinese | Papyrus Watch - Exposing the overuse of the Papyrus font. 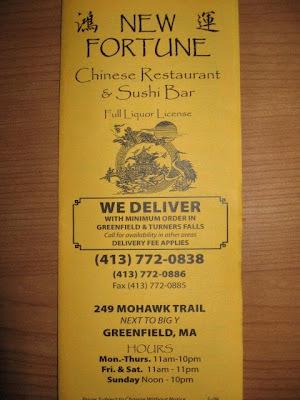 Christopher snapped us a brochure for New Fortune Chinese feature Papyrus as their main logo font. There's a ton of different fonts going on there, actually. I've been to some cheap restaurants and take out places...a lot of which likely make their own menus and brochures. This is likely one of them, and well, I'm really not especially stoked on this place now, but I would eat it, and I wish I was eating it right now.